How much Christmas music is too much? The Downtown Boston Business Improvement District’s Dixieland band at Downtown Crossing. It was the week after Thanksgiving, and in the basement of Boston Kebab House in the Financial District, Gene Autry grinned his way through “Rudolph the Red-Nosed Reindeer” and Bing Crosby crooned “White Christmas” as diners munched their lamb kofte and falafel. An anodyne, tinny rendition of “Feliz Navidad” needled CVS on Washington Street, and Stevie Wonder bounced through “Everyone’s a Kid at Christmas” at nearby DSW. At Macy’s in Downtown Crossing, “Sleigh Ride” ring-jing-jingled through the store-wide speaker system, clashing with the ferocious riff of Björk’s “Army of Me” coming from the MAC Cosmetics store by the north entrance. Vegetarian fast-food joint Clover had not put on its Santa hat; it was blasting Martha and the Vandellas’ sizzling “Nowhere to Run,” which pretty much summed up my attitude toward holiday music at that point. And it wasn’t even December yet. Before we take our last bites of pumpkin pie, holiday music starts piping into some restaurants and retail stores. The ubiquity of commercial Christmas music has even given rise to an online game, the Little Drummer Boy Challenge, which has spread around social media every holiday season for the last several years. If/when you hear “The Little Drummer Boy” between Thanksgiving and Christmas, you’re out. I have won once, and it was the year I spent most of the season sequestered in my small-town college library, studying for finals. “You know you’re going to lose that game,” my editor said to me as I set out to collect data for this story. I said it was worth it, and wondered which version would knock me out. Would it be the rendition that popularized the song, by the Harry Simeone Chorale? Bob Seger & the Silver Bullet Band, from the star-studded, ’80s-tastic compilation “A Very Special Christmas?” It was Sufjan Stevens’s mumbly take that did it in 2015, but I knew it wouldn’t be that or the slick a cappella superstars Pentatonix if the blow was delivered via Magic 106.7, now billing itself as “Boston’s Christmas station.” It mostly plays Great American Songbook-era holiday classics, or country and adult contemporary covers of the same. No Sia or Ariana Grande under their tree. New Christmas songs have precious little sticking power year to year. Sometimes they bubble to the top, but they’re inevitably buried under an avalanche of “White Christmas.” The notable exception is the perennial No. 1 song on Billboard’s Holiday 100, which is compiled for a few weeks each year: Mariah Carey’s 1994 “All I Want for Christmas is You,” a masterful bauble of songwriting unmatched in its cheer or catchiness. At one store downtown where Christina Aguilera was twisting “Have Yourself a Merry Little Christmas” into melismatic curlicues on the store’s speaker system, an employee grimaced when asked how long Christmas music had been the soundtrack to her workday. She said it had been playing since before Thanksgiving, and she was mostly hearing different renditions of the same songs. The employee, who asked not to be identified, said that because the store used curated streams from a business-to-business music service, she had no say in the playlist. Ola Sars is the founder and CEO of Soundtrack Your Brand, one such service based in Sweden. Its local clients include hair salon chain TONI&GUY, J. Crew, and “multiple” small businesses, a spokesperson said. According to Sars, retailers would be wise not to let staff control the music, but he doesn’t advise starting the holiday tunes before Thanksgiving or using an unvarying selection of songs. “You need to have three, four, five hundred tracks in rotation to not be too repetitive and annoy customers or annoy your staff,” he said on the phone from Stockholm. In November, Soundtrack Your Brand conducted a survey of more than 2,000 American and British consumers and retail workers, in partnership with Retail Action Project. Among staffers, 47 percent said they enjoy holiday tunes at work, while 21 percent said they dislike it. As for American shoppers, 56 percent said they like hearing Christmas music in retail establishments, while 17 percent said they don’t. And among the latter, almost half indicated that feeling was caused by repetition. Retailers may play holiday music to put people in a festive shopping mood. But by the week of Christmas Eve, when one in three songs streamed on Soundtrack Your Brand’s platform is a seasonal song, it’s no wonder if many feel like Scrooges. Walking down Milk Street, the sounds of brass echoed off the stone buildings. I recognized it as the klezmer tune “Odessa Bulgar,” courtesy of a Dixieland band wearing the bright jackets of the Downtown Boston Business Improvement District. 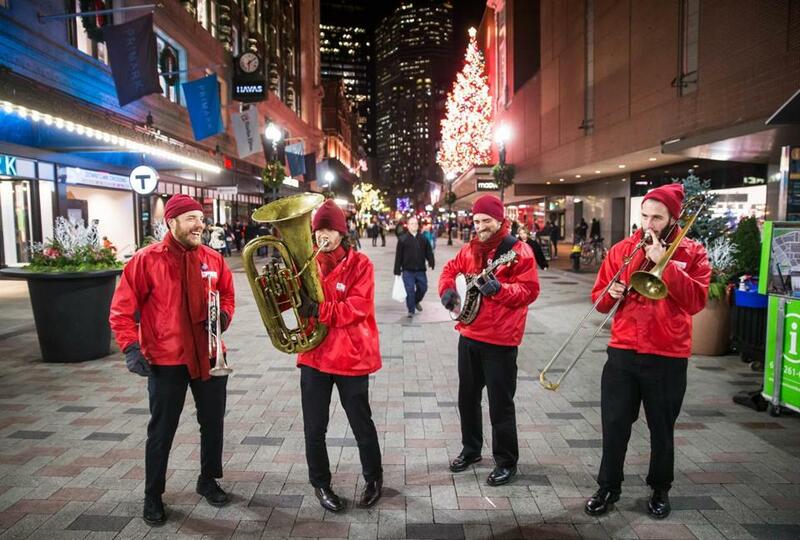 The district ramps up its public entertainment around the holidays; every day between Black Friday and Christmas, numerous groups of its instrumentalists and carolers serenade Downtown Crossing around lunchtime and the evening commute. Sam Dechenne, 33, plays trumpet in that Dixieland band, which plays a potpourri of carols and the band’s standard repertoire. “I might be the only one, but I like [the Christmas music.] I don’t ever get sick of it,” said Dechenne, smiling brightly. His most commonly requested song during the holiday season is “Rudolph,” but it’s useful to have a long list. “Some people walk by, I say ‘You wanna hear a Christmas tune?’ and they say ‘No, no, play something else!’” he said. So maybe the recipe for happier holidays is a flurry of festive songs rather than a blizzard, at least in early December. When I went to observe, neither Starbucks nor Dunkin’ Donuts had apparently hopped on the sleigh ride, and Old Navy alternated energetic modern seasonal tracks with similarly peppy pop cuts. Before we take our last bites of pumpkin pie, holiday music starts piping into some restaurants and retail stores. Sars said he recommended a mix of seasonal and evergreen tracks to please customers and workers. “We’ve seen that businesses have become more educated, and played more normal music,” he said. Personally, there’s another upside to this mix. At press time, I have not yet lost the Little Drummer Boy Challenge. And according to the rules, playing those pa-rum-pum-pum-pums for someone with the intent of making that person lose does not count. Just in case you were thinking of trying any funny business. Zoë Madonna can be reached at zoe.madonna@globe.com. Follow her on Twitter @knitandlisten.